No blood, no zombies, but a really cute anime! Probably I watch many different anime with a school setting, and this was one of my favorite. interesting. For season 2, I'm sure there's more drama and "love". Amazing, heart-warming, and perfect in every way. For those who haven't watched the 1st season yet, please do make sure to watch it first and then start this awesome series. This show really relates to most of us. It's the kind of anime you can watch anytime and it will always make you laugh. I actually teared up so many times while watching this show, just because of how simply beautiful and fitting it was. Each episode have their own unique quirks that definitely struck you with different emotions. One minute you'll be sad and the next thing you knew, you're laughing. This season has a lot more character development. The art was just as beautiful as it was in the first season. And the soundtracks are awesome as ever! This show deserves a 5 stars. It was amazing, heart-warming, perfect in every way and full of fun times that are enjoyable to watch. The animation is smooth and cute. The stories in each episode have their own unique quirks. The personalities of each character are well-distributed, and each of the protagonists are charming in each of his own way. And because their friendship is so pure and simple, it makes you feel all warm and fuzzy inside. The pastel coloring and occasional cat snapshots are just adorable. Not to mention the excellent choice of opening and ending songs. ShounenT. <3 I feel like it really adds to the sweetness of it all. Even though it might seem a bit boring to those who prefer more suspense and action, I find this anime really precious. It expands on its own pace, and once you get used the laid-backness of it all, Kimi to Boku really grows on you. It's definately something that I'll rewatch afterwards. Improved season 1 in every way. Reaches deeper into the audiences' soul and memories. The second season of You and Me. surpasses the first one in several ways. First of all, the series has a lot more character development for the main cast, as well as more appearances for the supporting roles. Secondly, the different story-relationships progress a lot in some cases, and in other cases there is even closure. While improving in some areas, the series also maintains what made it successful at the beginning: calm environment, warm stories, and one great balanced lead cast. The show also improved its musical score for the opening and ending sequences. A much more improved show which deserves a third season. Excellent second half. The light hearted story about friendship, mischief and growing up continues; as the same cast of characters returned for the 2nd season of “You and I” with the same feel good factor and subtle twist of unpredictability within every episode. Honestly speaking, the story regarding a circle of friends and their everyday adolescent life would be bland and rather boring by itself: If not, for the ingenious story telling style of the writer and illustrator Kiichi Hotta. I’m not talking about narration my friends; but, rather how the story flows—so smoothly like a 12 year old scotch; the writer’s vision and his keen observation of human character. Along with penetrating power of thought is quite refreshing, as he uses every possible means,—to let the idea behind the story reached out—from his heart into ours: Which includes the plot, the illustration of the feline characters, and the music; under the direction of Mamoru Kanbe. I don’t mind saying that this particular anime series produced by J.C. Staff,—definitely belongs to one of those well made category, so to speak. The lives of 5 young guys in their own world.. This anime is full of life.. You can say it's their 'days of their lives'. Every week, every episode is a new adventure getting themselves into problems, love-struck or even down.. The wonderful atmosphere and joy you get out of watching the episodes will make you remember them past times you've encountered. Look for a small ideals. This story with little plot and slow character development proved to be more than cliche High school life, some time even the best kind of stories is started from real emotions. And that I'll believe is a breath I haven't breathe in a long time. If this anime doesn't reach your expectation, lower yours- because you're to enjoy the one thing many future generation will probably never look back on. 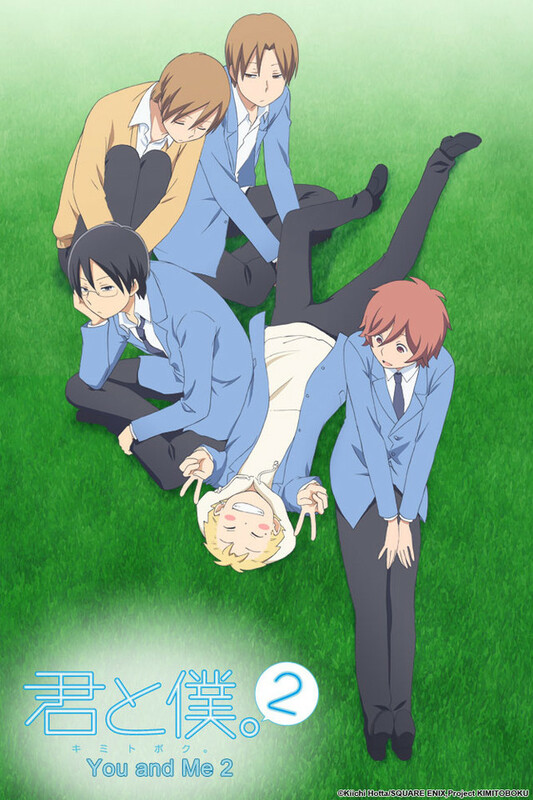 Excellent Slice of Life ..
Just like You and Me, the first season, this one continues the same story and revives the characters of an addictive slice of life anime. There is not much else here besides finding out what they are doing everyday, but whatever they are doing is interesting and anyone watching this just for the slice of life elements will never be bored.